I have blogged about my love for carnations a couple of times, (here and here) however this twist on the popular ball of carnations recently caught my eye. The creation by Larry Wood of Ninth Street Flowers in Durham, NC and is modern, stunning and eye-catching. Thanks to Daniel J. Pesta for sending over this image. He recently captured this image at an industry event in North Carolina - and I love it! Thank you for posting this! Steph and I were searching around on the web a few weeks back trying to pitch this to a bride. 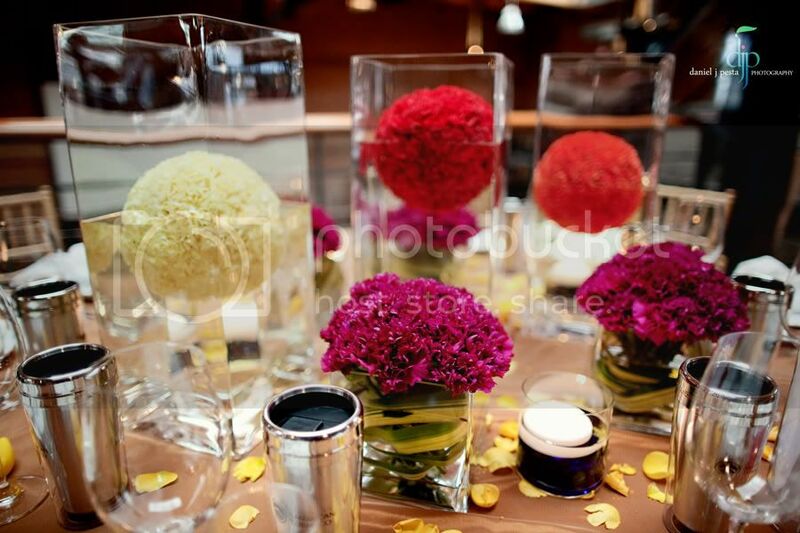 The carnation balls are so fun, but elegant looking! Love it, love it, love it! This little post gives me lots of ideas. :). What a creative twist. Thanks! I see so many carnation balls, which I love, however they get old after a while. Seeing them submerged in water is a great idea - LOVE how this florist made it look like they are floating! So beautiful and tactile! Definitely a great twist on the regular carnation ball. I seriously need to try this!